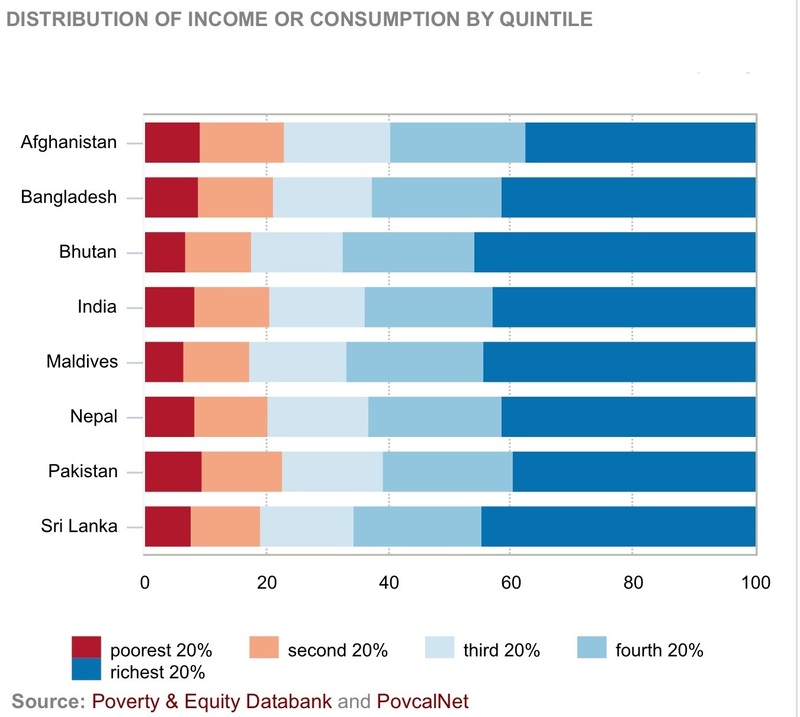 With the viewership of this blog now touching 95 countries, the most views appear to be on issues of poverty and human development and so I thought it was time to revisit some aspects of income poverty, especially in the South Asian Region, which is home to the largest number of poor people: 43 per cent of the developing world’s 1.4 billion poor people live in South Asian countries. 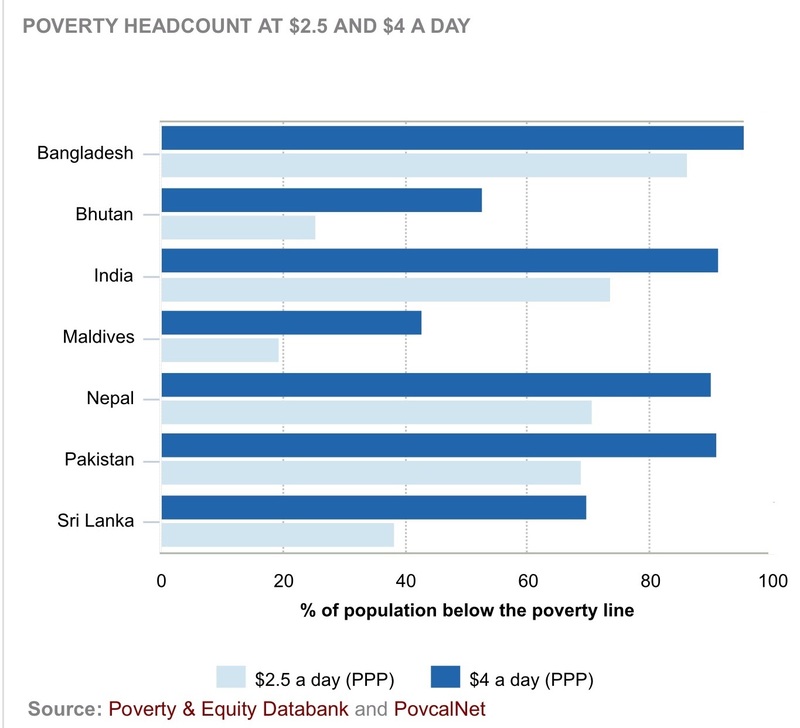 Although the three largest countries in the region, India, Bangladesh and Pakistan, have managed to substantially reduce extreme poverty in the last 2 decades, their vast populations add up to frightening absolute numbers of the absolute poor (< US$ 1.25 per day per capita). What is more challenging for the governments in this region however, is the proportion of their populations in the next slab (US$ 2.5-US$4) – just escaping being labelled as the absolute poor, but still seriously deprived in all aspects of life such as health, education, shelter and livelihoods. So who are these people? The small land-holder, share-cropper or farm labourer in rural areas; and the stalwarts of the informal sector in urban areas. This group may have just enough primary education and basic food security to cross the official poverty line, and ironically, are doubly deprived because they miss out on the meagre subsidies earmarked for those below the poverty line. Neither the governments in the region, nor the formal sectors have the will or incentive to address this type of poverty. In fact, it is universally acknowledged that it suits and profits the private sector to maintain a large informal sector, especially in the urban areas, as this unorganised sector has no collective identity and therefore no bargaining power and can be exploited at will, relentlessly and for ever. Another factor brought out by various UN reports and databases is the growing disparity in the countries in South Asia. Income inequalities have grown steadily in South Asia since the early 1980s, in both urban and rural areas. This income inequality does not follow the classic ‘have’ and ‘have-not’ dichotomy across the country, but is further compounded by disparities between regions in the same country. For example, studies of long-term trends indicate that while the share of the total number of India’s poor in the southern states of Andhra Pradesh, Karnataka, Kerala and Tamil Nadu decreased from 18% in 1993-1994 to 15% in 1999-2000; the share in the total number of poor in the states of Bihar, Orissa, Madhya Pradesh, Uttar Pradesh and West Bengal jumped from 57% to 63% during the same period. Therefore, although there has been a steady decline in the incidence of poverty in India, the efforts of the Government have not resulted in a uniform impact across regions. Previous Post Kerala: God’s own country?